This is considered to be one the forbidden topics in Pakistan. We don't talk about it at our homes, our schools don't teach us. We learn it or hear it form our friends or society which results in misleading information and because of this we fell into harassment behaviors on different levels. Its such a miserable situation that sometime even attacker don't know that he is committing a crime which is strictly punishable by law. Most of the the time victim is also unaware of his/her rights and number of cases went unreported. We need to teach our children at school, above ad is one kind of example which should be appreciated. I did some R&D there number of organization working women rights if you are victim of work harassment don't be silent and report it immediately to authorities. Pakistan is a developing country comprising of a patriarchal society with well-defined gender specific behaviors. The general consensus in the society holds men as the dominant, powerful and superior beings, whereas, women are often considered as weak and powerless in the society. These diverse views have led to a clear distinction between the rights of men and women across all sectors of the economy and resultant, women have not been able to fully contribute to Pakistan’s development. Despite the Government of Pakistan’s (GoP) efforts in increasing the number of women employees for the last several years, the minimum quota for 5 per cent remain unfilled. 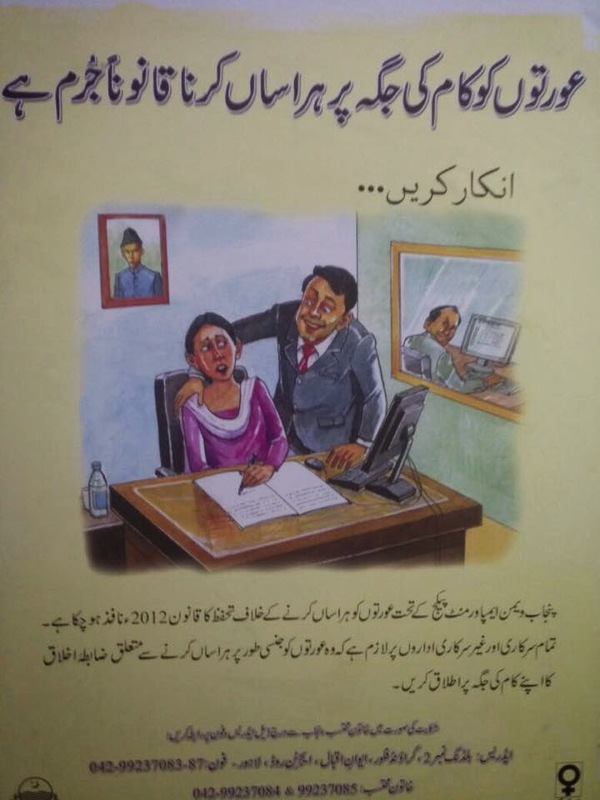 In 2010, President Asif Ali Zardari passed a Bill, titled, “Protection Against Harassment of Women at Workplace Act” while recognizing sexual harassment as not only an issue but a punishable crime. This form will ask your information and information about the complain, such as the name of witness or any prove as video or photage. If you have a copy of the complain, please have it ready to attach to the form. Providing us with as much information as possible will help us handle your complaint quicker. If you wish to complain in writing, our postal address and fax number are available on the Contact us section. How does sexual harassment occur at workplaces? What types of punishments are provided under the law? If you lodged complaint within your organization i.e. to inquiry committee, following two types of punishments can be given to the guilty person. The Competent Authority can impose one or more of the following penalties on recommendations of inquiry committee. While, if you have lodged your complaint directly to Police, the convict can be imprisoned for a maximum term of 3 years, or fined with a maximum sum of PKR 5 Lakh or with both. AASHA means “hope” – a hope to root out harassment especially of women from the society. H# 08, St. # 31, F-7/1, Islamabad, Pakistan.